I'm just starting my conversion and, as I expected, I'm running into issues with parts. The only sleeves I can get with the right ID for the struts are 6" long. Car is a stock '85 SE 2M6. What struts are you using??? I'm using KYB struts from Summit with the 7" x 2"id Monroe style perches from Speedway Motors. Springs are 12" 300# QA1s also from Summit. I just purchased all of the pieces within the last 6 weeks, so it should be available. I'm using Monroes as my base - it's what I could get (here in the UK) at a reasonable price. The sleeves were an impossibly tight fit - wouldn't go on until I stripped the paint off the struts! '85 SE 2M6 automatic w WS6 suspension, factory sunroof, slightly modded interior, after-market cold air induction kit, rear spoiler, original Tech alloys, component speakers instead of the 4x10s. Outstanding tasks - adding electric windows, locks, and mirrors (all the bits sitting around in a box, awaiting time...), getting some 15" lace alloys and some more useful rubber, am also looking at converting the rear struts to proper coilovers (just 'cause I fancy another project!). Looking for any useful suggestions for a problem with my DIY coilovers. The fit of the sleeves on the struts is so tight that I had to strip the paint in order to get them to slide on. I then tried sliding a sleeve on - it went most of the way down without any problem, then stuck, as you can see in the 2nd picture. And I do mean STUCK - I didn't use any force putting it on, but I can't now get it off (so that I can file the strut down slightly for more clearance). I've tried getting some silicone spray lubricant in behind the sleeve, but no luck. I'm reluctant to hammer downward (or upwards) on the locking rings in case I ruin the alloy threads. Outstanding tasks - adding electric windows, locks, and mirrors (all the bits sitting around in a box, awaiting time...), new wheels and rubber, as well as rear adjustable coilovers, and poly bushings all 'round. If the sleeve is stuck, try heating the sleeve with either a plumber propane torch, or perhaps a hair dryer. The aluminum sleeve will expand faster and more that the steel strut. And the sleeve should loosen up to the point where you can tap it off with a soft faced mallet, or maybe pull it off with a leather glove. "Its nice to be important. Its more important to be nice." For that matter, heat the sleeve and slide it on. Thanks - will give it a try. I'll try to get it off and then prep the barrel of the strut a bit more. I have realised that where the part number is stamped into the barrel, the edges of the characters are raised slightly - just enough to reduce the clearance. If I can get the sleeve off, I can file down the edges, then the sleeve should slide right down. Is the inside of your sleeve smooth? Mine had a ridge I had to grind down. The other sleeve is smooth so, making an assumption here, the stuck one is OK. I've got a few suggestions and, hopefully, I'll have some time over the weekend to sort it out. I used 7" perches for Monroe shocks from Speedway and KYB struts and QA1 300#, 12" springs from Summit. Got the sleeve back off the strut - used the propane torch method. Will now take the circumferance of the strut down slightly, then should be good to go! A little off topic, but what was the reason front coil overs are not practical? 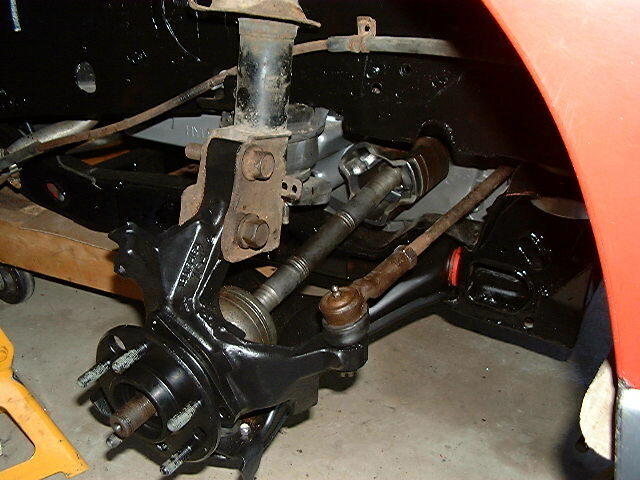 I was thinking you could box in the lower control arm from a picture but I'm nowhere near a car that I could look at for other possible clearance problems that would need to be dealt with. has anyone used the coil-over kit from Fiero addiction? it looks the same as held just not quite as much money. I would like to get somthing ordered soon so any feedback would be great. Slghtly O/t, but I've noticed that the kits available Stateside have a single adjusting ring with grub screws to lock, whereas all of the kits I've seen over here use an adjusting ring and a lock ring. Comments, e.g. what is the likelihood of two rings locked slipping against the likelihood of the grub screws damaging the threads on the sleeves? That's my reason for considering boxing them in to make them stronger to counter any inherit flexibility. Is there really any benefit to having the shock inboard to the spring? It seems all you would need is the adjustable collar underneath, between the a-arm and the spring, and leave the shock to the side. - Boxing the a-arm was my first thought, though. Back from holiday, and have taken the spring seat off the second strut and put the sleeve on it. Just need to buy some springs now. I have decided to buy proper strut tops, rather than modify the originals - it's purely an esthetic thing. Haven't decided yet whether to them from West Coast Fiero or Fiero Addiction - does anyone else make them? Outstanding tasks - adding electric windows, locks, and mirrors (all the bits sitting around in a box, awaiting time...), as well as rear adjustable coilovers, and poly bushings all 'round. 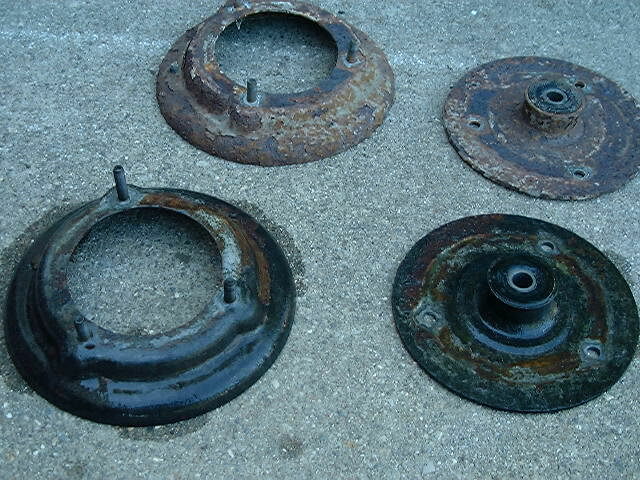 I ordered my strut tops today, from Fiero Addiction, so will see how long it takes to get them and, in the interim, will order some springs. Built mine a while ago thanks to this thread. 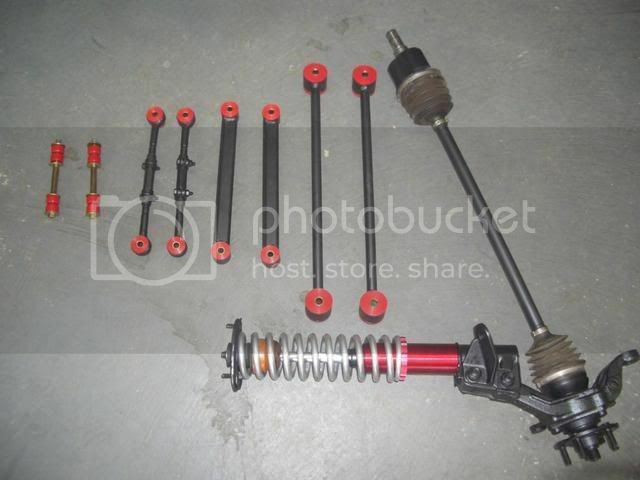 Well, I finally got around to buying both the strut tops, from Fiero Addiction, and the springs, from Faulkners. How would Coil-over conversion for an FWD x-body/a-body work for front and rears? Would the rear be strong enoughI know that fiero shocks and struts will work on my x-11 and a few members have done that to lower their car several inches. Wondered what would be better for handling? So I'm feeling a little overwhelmed with info and options. I have an 86 SE with a 3800 SC manual 4spd in it. I'm looking to make some coil overs... I currently have KYB's in the rear. I want to do this right the first time. Anybody with lots of experience who wants to give me a few pointers, please let me know. I've read a lot in this thread about guys with 350 swaps, and stock motors, and people who have posted what they've done, but not entirely too much on how it worked out for them, or if thjey would have gone with another spring rate if they did it a second time etc. Thanks! Buy the pieces you need to simulate what I bought from Held since that setup is proved to work and works very well on my Roadster. I used 350lbs and like them, from what I know about your car 300's should be just right for you. Get a 5" inch threaded collar and the longest springs you can fit - with your ride height 10-12" length range would be best IMHO. Thanks for the suggestion ryan, thats not a bad idea. What spring rate you guys recommand for a for a 88GT with a Shelby S1 and a 4t80. I am looking for about an inch drop in the rear. So what would I need to make this happen? Finally finished my conversion over the weekend. After I finished the job,I went out looking for potholes, sleeping policemen, and cats eyes, and was really pleased with the results. Although the suspension still needs to be properly set up front and rear, I was surprised by how smooth the ride was - I had been worried that the 375lb springs would be too stiff, but that isn't the case at all. Interestingly, there was a minor, but obvious difference in the angle of the struts at the knuckles when I started (they are much closer to the same angle now). im thinking of doing this when i get some money. Nice writeup. I'm STILL waiting for someone who did this with the cheaper sleeves from a kit for another car to tell us what works. Has anyone actually done this??? There was a used set on egay recently that the guy said was for a "92 93 94 95 Honda Civic Hatchback". I asked him & he said the inside diameter was 2 1/2", which if I'm not mistaken (I haven't re-checked) will fit our struts. Of course, as usual the idiots at egay bid more for these than a new set goes for so I didn't bid. DO NOT TOUCH THE TREUM! Thought this link might help everyone out as well. I just picked up a set of 2 sleeves and nuts with some hats for 10.00 from a guy at work.I have the kyb rears these are just over the 2inch id i was reading about will these still be ok? GT, the sleeves I got were a larger diameter at the top and bottom, but tapered in and were narrower in most of the sleeve. I can't tell from your picture if yours are the same ID all the way through or not. On a related note, has anyone else that has used 300 lb springs or higher had problems with the springs not being secure when adjusting the collar down to get a nice ride height? What I mean is, to get the ride height to sit lower than stock, I have to crank down the adjusting collars, which causes the springs to not sit against the upper strut mounts (with the car in the air, of course). I know that the springs should stay in place with normal driving, but the off chance of hitting a big bump, pothole, dip, etc. worries me about the spring falling away from the strut mount and not seating correctly, not to mention the big 'clunk' it would make. they are the same size all the way .I may just buy the wcf kit so i know it will work correct.